Bronze Fitted Cast Iron Construction. Close Coupled to a 1/2 Horsepower, 3450 RPM, 115/230 Volts, 1 Phase Motor. Ports are 1-1/2 Inches NPT Inlet, 1-1/4 Inches NPT Outlet. Impeller Diameter is 3.63 Inches. Four Position Casing. Discharge can be located in any of four positions. Casing is close grain iron of 30,000 psi minimum tensile strength. Back pull-out design eliminates the need to disturb piping should the pump ever require service – the casing stays in the line. Replaceable Casing Wear Ring. Prevents wear on casing and is also easy to replace. Easy To Service. Taking out only 4 cap screws allows removal of pumping assembly hence without disturbing piping. Enclosed Bronze Impeller. Enclosed bronze impeller is of latest hydraulic design for maximum efficiency. It is balanced for vibration while free operation and threaded onto stainless steel motor shaft. Mechanical Shaft Seal. Standard self-adjusting shaft seal due to temperatures to 225 °F (107 °C) and pressures to 150 psi (1034 kpa). This product has Ceramic seat and carbon seal face consequently for long trouble free service. Special seals are also available for higher temperatures and fluids other than water. All Pumps Factory Tested. After careful assembly and inspection, EVERY pump is factory tested and hence will meet Hydraulic Institute standards. Protection From Overload. 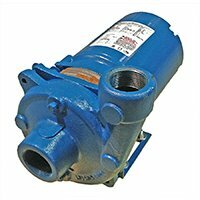 Burks single phase ODP and Totally Enclosed motors therefore have built-in overload protection. All three phase motors and all explosion proof motors must be installed with a magnetic starter which provides full 3-leg protection. Failure to use correct starter while in use and overloads will void motor warranty. Individual performance curves should also be checked for final selection. 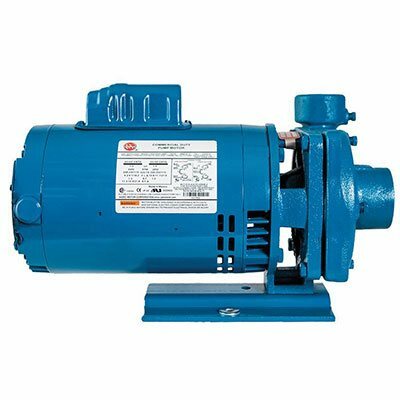 Standard pump motors have open drip proof construction and are rated with jet pump service factors for continuous duty operation. Motors are 56 frame size with NEMA standard mounting flange, one piece threaded stainless steel shaft and ball/ball bearing construction. 1/3 thru 2 HP – 115/230 Volt. 1/3 thru 3 HP – 208-230/460 Volt. In conclusion, Voltages may differ from some suppliers. Consult factory.